[update] Sadly the site has been discontinued and is no longer available. While the Twitter is supposed to be very conversational most of the time you miss those, unless you participate or follow participants (and chat doesn’t get drowned in timeline noise). 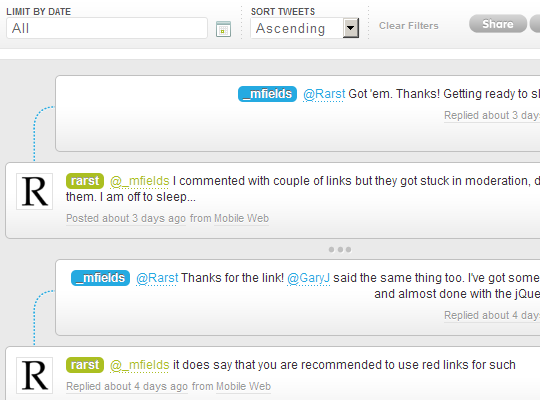 New interface improved looking up replies, but that relies heavily on using proper reply links. bettween is a site that given two Twitter usernames puts their conversations together for you. given two it will show the actual tweets accounts exchanged. Tweets displayed retain pretty much all of the usual attributes – avatars, relative time, client used. The distinction for the better is that known replies are shown visually, rather than by obscure “in reply to…” link. Display of the conversation is very convenient to follow and can span quite far in the past. There is date filter available, if you are looking for something less recent and sort reverse if you want to start from oldest entries found. Conversations have clean nice links that include account names – easy to share around. Initial indexing of account or conversation (when you open someone not that famous like yourself) can take quite a few minutes. Site seems to suffer from hosting less powerful than it needs and can often be sluggish or error out. The formula of only two accounts for the conversation feels like a considerable limitation at times. It would be highly convenient to read conversations that multiple parties participate in. As for other features missing – RSS feed for conversation would make ton of sense. Site is very convenient for its purpose, but suffers from performance issues. Might be attributed to beta status but it seems to be one of those eternal betas, being up since at least 2009 (according to footer). « Google Docs – office suite for everyone or no one? I am no fan of desktop twitter clients but on other hand I hadn’t tried any in a while. So bettween works nicely for me. Update: They don’t work anymore. Thank you for update – I’ve added note to the post. It’s a pity, was quite useful at times.